1. I will post a new nutrition and fitness challenge for the week each Sunday for you to begin on the following Monday morning. Modification is allowed for people who have health challenges, but if you do not have any challenges, push yourself. You are only as strong as you allow your mind and body to think and be. 2. Since everyone has busy and different work schedules, you will have until midnight on Saturday to complete the challenge in its’ entirety. 3. We are all at different levels in terms of our fitness. If you are in the beginning stages of working out, just complete the nutrition and fitness challenge. If you have a nutrition plan and workout regimen, try to complete the challenge in addition to your current meal plan and workouts. 4. Be accountable to yourself and to the group by posting pictures and videos of your workouts and meals as well as tell us about your setbacks and successes during the week. We want to rejoice in your progress and inspire others to get back on track. 5. Ask questions! Unsure of how to do an exercise or if something is healthy or not? Found a great new snack or food item you want to share. Now, is the time to share, ask and learn because when we know better, we tend to do better. 6. No negativity, judgements, or profanity allowed. This challenge is about encouraging others in trying to live a healthier life. Anyone who is in violation of this rule after one warning will be removed from the page and blocked. 7. No solicitation is allowed. This group and challenge is for encouragement, education, and inspiration only. Personally, I do not promote detox teas, supplements, body wraps, etc. because that is not my national health and fitness platform. I lost my weight through changing my nutrition and exercising only. I did not lose nor maintain my weight loss using those items, therefore I will not allow them on my page or to be sold on my page as well as any other non-fitness products or services. 8. Most of all, learn, have fun, forgive yourself and don’t give up! Fall back into FITness in becoming a healthier you! Now let’s get this challenge started! ***Disclaimer*** All posts and information provided within this page is for informational and educational purposes only and is not to be construed as medical advice or instruction. No action should be taken solely on the contents of this website/social media page. Please consult your physician or a qualified health professional on any matters regarding your health and well being or on any opinions expressed within this website. You as the reader must be responsible for consulting with your own health professional on matters raised within. I am not claiming to be an expert, certified nutritionist, personal trainer, psychologist or psychiatrist. I am merely writing and sharing about my own experiences, things I have tried, tasted, cooked and liked. I, the owner of this social media page, will not accept responsibility for the actions or consequential results of any action taken by any reader. The views expressed here are my personal thoughts and opinions. 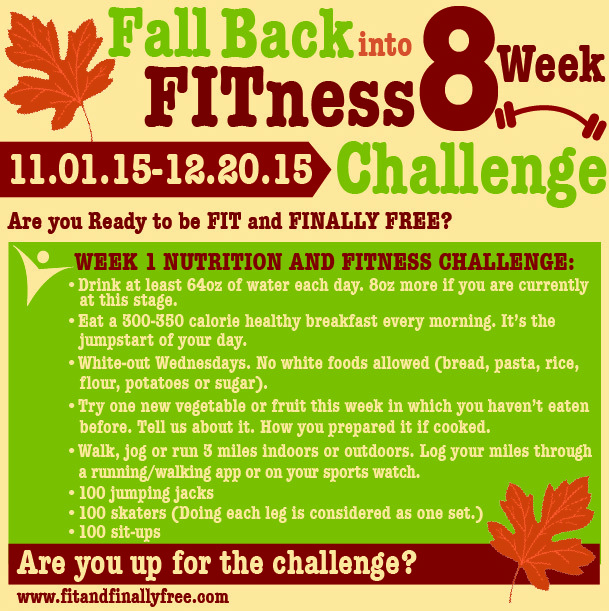 This is a great fitness challenge! Looking forward to learning more. Good luck! Just stumbled across your article. I need this right now. I have allowed myself to gain back 10 lbs of 60 lost. I’m in freak out mode right here at the holidays. Hoping to use this challenger help me get back physically, emotionally, and spiritually. I hope it helps you too Lisa. You can do it. Follow me here or on fb and instagram at Fit and Finally Free. I’m looking forward in hearing about your progress. Live and Be Well.